I don't cook meat very much. I'm not very comfortable cooking meat. Much of my cooking education came in a huge vegetarian co-op at college, and I just don't eat enough meat to have picked it up on my own. But when Lauren posted about the deliciousness on TasteSpotting, I got really inspired to try to make this chicken curry. 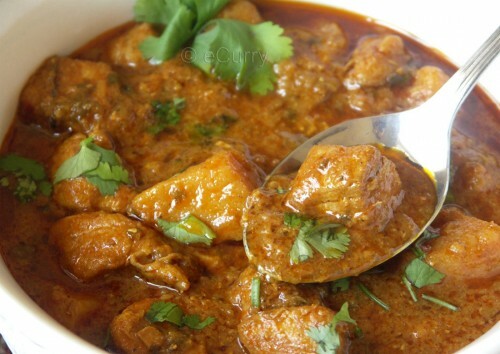 It seduced me with its promise of tender pieces of meat swimming in a cardamom-infused slightly spicy sauce. I decided to add in a good amount of spinach to make the dish a little more nutritious, hoping it wouldn't change the sauciness I saw in the picture. First I prepared all my ingredients mise en place. This is a great trick to use if you don't have a big chunk of time to cook; just peel and chop whenever you get a moment and refrigerate/freeze until you're ready to use that ingredient. It also makes cooking a new recipe much easier, as you're not trying to wash/chop/stir different ingredients all at the same time. Keep in mind that this curry would be endlessly modifiable to what you have in the kitchen: different sorts of root vegetables for the potatoes, beef instead of chicken, leeks instead of onions, etc. It's not too picky. Mix the cardamom with the coconut milk, set aside. Heat oil, cloves, and cinnamon stick in a big pot. When the spices start to sizzle, add the onions and sugar. Cook until glazed and golden brown. Add the cubed chicken, some salt, turmeric, and chili powder. Cook, stirring occasionally, until the chicken is slightly browned on all sides. Add the potatoes, garlic, ginger, and tomato paste/water mixture, stir occasionally to keep the bottom from burning. Add additional water or stock if you'd like a soupier sauce. Cook until the mixture is simmering happily, then add the cardamom coconut milk, cover, and cook until the potatoes and chicken are tender. Meanwhile, remove stems from spinach leaves and wash really well to remove all the dirt and grit. Once the chicken is done, stir the spinach in and cook another minute or two to wilt the leaves. Salt to taste; I found I needed to add much more salt than I would have expected. The curry was so good I had trouble waiting for it to cool enough to eat. (Although it begs the question: is a curry still a curry if it doesn't have curry powder? What exactly is curry powder made of, anyways?) It was a bit spicy, but not so much as to overwhelm the other, more nuanced spices. My dish didn't look anything like the picture that came with the recipe, but it was still beautiful. The sauce was a pretty pinkish red color, and the bright green spinach provided fresh visual and textural interest. Packing the curry into tupperware containers for lunches the following days didn't diminish it's tatstiness, but it sure looked ugly. Most of the sauce had been soaked up and turned brown, and the spinach had become that brassy green/grey color that trains children from an early age to hate the stuff. Luckily, it was still delicious, nutritious, and really filling--a perfect work week lunch. If I make this recipe again, I'd do a few things differently. I'm a fan of a higher sauce-to-chicken ratio, so I'd double the coconut milk to 1 1/2 C and add in a cup of chicken stock as well. The sweeter cardamom/cloves/cinnamon flavors didn't really come through the spiciness of the chili and ginger, so I'd up those quantities too. Using ground cinnamon and cloves instead of whole spices infused in the oil would probably do the trick. But overall, I'm really proud of my attempt to cook meat--turned out pretty darn good!